Through SCE’s Charge Ready program, the LA County Department of Public Works added 14 EV charging stations to charge the electric cars in its service fleet. When the Los Angeles County Department of Public Works recently added some all-electric Chevy Bolts to its fleet of service vehicles, 14 brand new electric vehicle charging stations were waiting to charge them up. 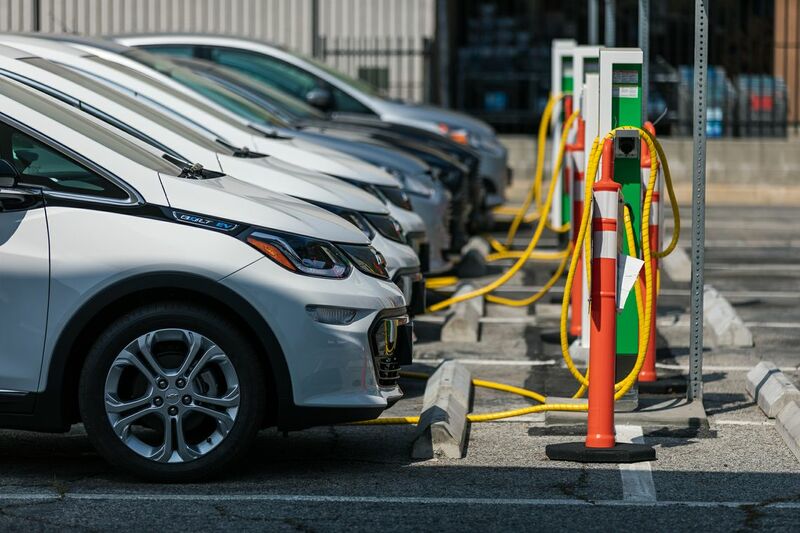 Those charging stations were made possible by Southern California Edison’s Charge Ready program, a pilot that provides infrastructure for hundreds of EV charging stations at fleet parking lots, apartment and condominium complexes, schools, recreation areas and workplaces. The program also gives participants rebates to help pay for the charging stations themselves. Charge Ready works with government agencies, universities, hospitals and businesses to install electric car charging stations where people leave their cars for a few hours. SCE recently installed the 1,000th station in its Charge Ready pilot, and is seeking approval from the state for a second phase to install 48,000 more. The Los Angeles County Department of Public Works, which has a $2.7 billion annual budget, is responsible for maintaining an infrastructure that includes everything from traffic signals to airports to water supply for the most populous county in the nation. “Many of the agency’s 3,700 employees have to drive around the county to do the work necessary to build, operate and maintain all that infrastructure,” said Keith Lehto, Public Works assistant deputy director. Of the 165 sedans in the department’s fleet, 22 of those are electric, Lehto said. In addition to the 14 new Chevy Bolts, which have a range exceeding 200 miles, the department purchased five Ford C-MAXes and three Ford Fusions last year. And two more Bolts and 27 plug-in hybrids are still on the way. Sean Skidmore, Public Works environmental compliance coordinator, said the experience with Charge Ready could not have gone better. “From the initial entry into the program, through the project design, and through completion of the infrastructure phase, SCE has proven to be a highly professional and reliable partner with whom we look forward to working with in the future,” Skidmore said. David Ford, an SCE Government Relations advisor who recently toured the newly completed Charge Ready site at Public Works headquarters in Alhambra, said SCE was happy to partner with the department toward helping California meet its greenhouse gas and clean air goals. “Charge Ready gives SCE customers like the Los Angeles County Department of Public Works more options for installation of charging for their fleets, as well as in customer and employee parking areas,” Ford said. The department has also applied for Charge Ready funding for workplace charging stations for headquarters employees, 115 of whom have expressed interest in buying EVs. The agency is also seeking alternative fuel options for its 1,170 light- and medium-duty trucks, vans and SUVs.